Is shopping on Black Friday worth the money or the risk? To many, the week that encompasses Black Friday and Cyber Monday is “buy or die” week. It’s buy or bust. I’ve never figured out how people can brave the elements, fight over limited parking spots, stand in long lines waiting for store doors to open, then try to avoid being trampled upon during the mob stampedes. Why Oh Why do people subject themselves to this? I will actually PAY to avoid crowds, parking difficulties, the inconvenience and the waiting. Time, after all, is money too! Let’s see why I avoid this like the plague while others revel in it. There are actually a few good practical reasons. 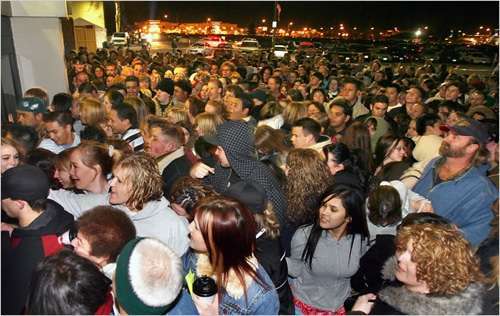 I’ve seen some reports stating that Black Friday is not the best time to purchase certain merchandise. Deals sites are stating that the following items will be discounted but you can get them at better prices at a different time. Toys – Buy these the two weeks before Christmas. Winter Clothes and Christmas Decorations – Better prices in January and February. Next Year’s Calendar – Again, wait till January. Jewelry – You may get better discounts throughout the year. Black Friday is a tradition. That is, this is the time when retailers make sure to hype things up with price cuts, but these prices may not be the lowest you’ll get during the year. Retailers are out there psyching you out and mixing great prices with more mediocre deals, while perhaps saving the best deals for later. Monitor prices of items on your Christmas list online before venturing forth! In general, shopping on Black Friday can save you money, but be careful. Because in some places, those discounts are not worth the risk to your life and limb. I culled together a collection of quotes and interesting facts I found in various stories about this day from CNN Money and the San Francisco Chronicle to explain why I hole up at home during the buying season. From my experience, little babies don’t really have that much of an attention span and toys are easily recycled and outgrown, so I hit Craigslist for many children’s items at an immediate discount. Then if the kid ignores the toy after a few hours, I won’t feel so bad. I hear stories that involve customers who come in early but leave empty-handed because they were still beaten to the punch by those who make off with popular products (particularly in the electronics and toys categories). For example, when the Xbox was all the rage, it would be off the shelves in as little as 29 seconds in some cases. Other prized toys would be gone in a short 15 minutes — even in online sites like Amazon! One hot item was a 19-inch TruTech flat-screen TV, selling for $179. A few customers even loaded up on four of the television sets. “I see everyone getting it, but I don’t really know how much it’s worth,” said 40-year-old Margalie Simon, who was carrying her own TruTech TV. Fourteen-year-old Marie Logan had $1,000 burning a hole in her pocket Friday at 5:30 a.m. when she arrived at the Glendale Galleria in suburban Los Angeles with her mother and 11-year-old brother. “I just bought whatever I liked,” said Logan. This is what retailers want to hear: this puts the Black in Black Friday. This is why the frenzy is not just potentially physically dangerous. It plays with your mind as well. When you get caught up in any frenzy, your brain shuts down and the herd instinct kicks in. This whole event may be dangerous to your wallet; rather than save, you can end up spending more on things you may not need since the temptation to make your effort be worth something is strong. The crowd tendency to spend is heightened, so it’s another “madness of crowds” moment. But what would be the point of the experience if you won’t be guaranteed that you will get what you want? Well that could be the case on any other shopping day, but this day at the mall to me is scary. Let’s look at the bright side: at least if you end up empty-handed, you saved the money for another day. Now what about that other aspect of shopping during Black Friday — the part where your sense of security is at stake? Where there are manic crowds, there can very well be threats of violence. There have been many incidents in years past when shootings would occur due to customers fighting over the same merchandise. And of course, theft is common as well, when thieves try to swipe the stuff you buy. Imagine this though, some people who have been interviewed by the news media have admitted to hiding guns in their jacket while they go shopping. Beware of the angry or defensive shopper! Just another thing to worry about: more crowds, potentially more trouble. This is one of the reasons I don’t go out on this day. Some people claim they even skip and miss Thanksgiving dinner to participate in the Black Friday bonanza. Some camp out like they would at a concert, eating nothing much but junk food. For many, this sounds like absolute, utter fun and excitement, like a rite of passage you need to go through if you’re living in America. Scalpers should also watch out: this could happen to you! Isabel Quintanilla of Los Angeles waited in a long line outside the Disney Store at the Glendale mall with her impatient nephew for 45 minutes. Once inside the store, it took Quintanilla 60 minutes to pay for her items, which meant she missed the 10 a.m. deadline to get an extra 20 percent off on top of the 40 percent off. But for her, the wait was worth it when she noticed she saved $14.40. All that pain to save $14.40. That was $14.40 for 2 hours of your life in an unpredictable mosh pit, maybe not including commute time either. I prefer to save $14.40 by buying less merchandise. And have you heard about the tourists who come to the United States just to shop on Black Friday? Visitors usually flock to metro areas, like Chicago, Los Angeles and New York, and also major border cities, like San Antonio, which draws Mexican nationals to its North Star Mall. Japanese jet-setters come to Honolulu’s Ala Moana shopping center for high-end fashion retailers like Dior, Fendi, Louis Vuitton and Hermes. In Miami, tourists are headed to Miami-based Dolphin Mall from Latin America, Mexico, Brazil and the Caribbean. believe it or not, some enterprises are now marketing Black Friday to tour operators. it’s a spectacle tourists want to see and they want part of the action. “They want to see the madness of people going to the mall at 5 a.m. to go shopping because that usually doesn’t happen in any other country,” said Lucia Plazis, a marketing specialist for Taubman Centers’ Dolphin Mall. According to Marshal Cohen, chief analyst at NPD Group Inc., Black Friday is “becoming the biggest sport”; sure, just like running with the bulls in Pamplona, Spain. Even with the day over, you can look forward to another big shopping day on “Cyber Monday”, on the first day of work after Thanksgiving, when people go shopping online at the office(!) in record numbers. As for me, I try to get our Christmas shopping all wrapped up in October. That is detailed :). You should put this up before any Black Friday…surely it will convince a few people against going shopping on the day. Hi Goldbguru, thanks for stopping by and the great feedback! I’m sure it’ll take a major event to keep many people from their shopping. Some of the stories are absolutely crazy. If that’s what it’s like, I’d hate to be inside any stores during Black Friday. I can only imagine all the pushing and shoving. That is exactly why I do most of my shopping online. I used to work retail when I was in college and am very familiar with this sort of thing. It is precisely why I would rather sleep in than be herded like cows. I usually wait till the coast is clear before I walk into a store (hence, forfeiting the savings on sales sometimes). Also, shopping online is great too, the one hassle it sometimes presents is when I have to return stuff that I purchased off the web and having to work to get my money credited appropriately in such situations. I’ve seen some crazy Black Friday videos where it starts off seemingly so organized and then like two or three jackasses just run past the line and then everyone starts rushing in. I’m not a fan of the Black Friday shopping craze. I’m not willing to wake up that early for much of anything. Not every product in a retail store on Black Friday is a good bargain. You have to be disciplined in order to buy only those that are on sale. I make a list of things that I am looking for ahead of Black Friday. Then use comparison shopping sites to compare prices from the different vendors to benchmark the Black Friday sales. Obviously, the Black Monday sales and a new twist! I did Black Friday once and decided it wasn’t worth it. Just as good deals can be found online. Waiting 12 hours outside in the cold isn’t worth saving a few hundred dollars on a laptop. Black Friday is a big shopping holiday for a lot of serious savers. But there are unfortunate events that can happen on this day. For instance, on one such day, a Bentonville, Ark. crowd basically turned into a mob, which “physically broke down the doors and knocked a Wal-Mart employee to the ground.” The employee was trampled upon and died in the process. Quite tragic. I feel badly for the worker’s family… Can’t anyone be safe doing their jobs anymore? There are extreme situations out there. When you work in retail, nobody ever expects that “rioting customers” (among them, probably resellers and scalpers for those hard-to-find items) to be a risk factor at your job. I guess you can also add “out-of-control customers” to your list of things that can threaten your life and limb, especially if you happen to work at a store! That’s why I rarely do my shopping in the brick-and-mortar malls. I have been gradually switching to online shopping, especially during the holidays, because of the higher risk of crime, accidents (navigating through sleet, rain, snow and traffic is no fun) and unruly crowds during this time of year. With so many shopping options, last minute gift ideas and discount deals that abound online, I don’t know why people still resort to joining the mayhem in malls rather than make their purchases from the comfort, security and safety of their homes. @Tina — What a horrible story (the employee who got trampled), I read it earlier as well. I believe it happened in Long Island, New York, Arkansas is where Walmart is based. When I read the headline I thought it would be an older employee, it was a 34 year old man. I can’t imagine what deal was so great you’d trample someone to get it. Mob mentality is not a good thing! Yes, I can see how 50% to 60% off for major items can be a big pull, but the competition for the limited supply can be pretty intimidating. Then again, if your neighborhood stores are seeing slower foot traffic or you don’t have an internet connection or you really have your heart set on certain specific items that are only available at these cutthroat prices in a physical establishment, then I can see how your local mall or shopping club can still be fairly inviting. I agree — prior to this holiday season, I would have never expected riots to be a risk of Black Friday shopping. Crowds, sure, but riots resulting in death? I really wanted to shop yesterday since that’s just what you’re supposed to do, but decided against it because I didn’t want to deal with the mob scene, but now I’m REALLY glad I didn’t hit the malls and stores! It’s so sad that it’s come to this. Last year two people were killed via gunfire over items and twenty plus were trampled (not dead, but hurt). This year so far I have not heard of any deaths via gunfire, and only one trampling (unfortunately they died). I think this is all about the mentality of the stores. If stores would actually stock up on the items that they say they are supposed to have, then people would not have to rush into the stores, and get everything. The first few hundred can get what they want. Rushing into the store is what does it. It is all stupidity, greed, and the thought of saving a buck. Most of the crap up for sale, was not even worth it. Things you could find any other day of the week for the same prices. Oh well, to each person their own. I think the media gets off rather scott free on this – they are the ones with “black friday reporters” and web sites, and trackers. It is all around the hysteria and anticipation. That would be a terrible way to go. Avoiding the crazed mob of people is always worth spending a few extra bucks in my book. I can’t imagine shopping under these conditions. You couldn’t get me into a brick-&-mortar at this time of year. Yeah the stories seemed sad and bizarre. I avoided black friday before and this pretty cements me not wanting to go out. I cant believe people were freaking out to get in walmart. I know walmart is cheap but (at least in my opinion) alot of their merchandise is pretty junky and breaks and needs replacement. So I don’t know how much one is really saving once you calculate the shortened lifespan and wasted time to go buy a replacement. This is not the fault of the retailer. And don’t blame the victim. It’s completely disgusting and I hope they get all the people who stepped on or over this man. Just to follow up on this. It turns out Wal-Mart had to pay for the Black Friday accident last week. Hopefully that will teach them from offering deals that are too good so people won’t charge the store to shop and get the discounts. I was at our local Best Buy the Wednesday before Thanksgiving and there was a whole family camped out in front of the store with a tent and folding camping chairs! I’ve never gone to stores on Black Friday since many of the best deals can be found online and there’s no crowds, no people pushing each other (or shooting each other), etc. This year many online merchants like TigerDirect and SmartBargains.com are continuing Black Friday and Cyber Monday type sales as we get to the last week before Christmas. Some of the best deals may be yet to come!